If you don’t feel like cycling, stay aboard the ship! This tour includes full board. In the mornings, you will receive a hearty breakfast, in the evenings we serve three-course meals. For the bike tours we provide you with packed lunches. From Passau to Vienna by boat and bike - this popular tour lets you enjoy the straightforward cycle paths along the shores of the Danube in an intensive but comfortable manner. The wild and romantic Danube valley, the charming Wachau region, the rough Strudengau - magnificent castles and monasteries and the pulsating life in three cities well worth visiting - Passau, Linz and Vienna - offer an unforgettable holiday experience. This boat and bike tour is straightforward and easily cyclable, even for inexperienced cyclists - if you don’t feel like riding your bike, just stay aboard the MS Normandie. Passau’s historic centre has a very distinct Mediterranean flair about it. Embarkation at 4 pm, departure to Engelhartszell at approx. 7 pm. Highlights of this stage include Monastery Engelszell and the Schlögener Schlinge, as well as Linz’s exciting night life. The Machland is both vast and friendly. Optional: Visit the Concentration Camp memorial. The Strudengau was once feared for its currents, now Melk abbey towers over the town. You will be able to enjoy some more of this region’s beautiful forests and nature, before you are greeted by the charming metropolis of Vienna, full of Austro-Hungarian imperial history. How about booking “Vienna by bike” or an operetta concert? There are several optional activities you can book. Or, why not explore Vienna by yourself? 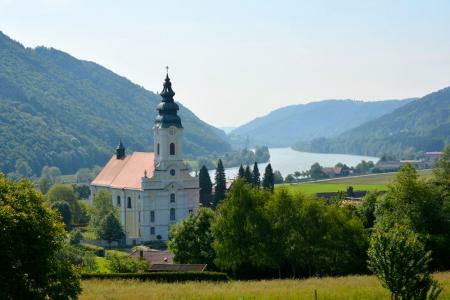 You will see a series of charmingly strung together villages, where the Wachau and Nibelungengau regions meet. Consider purchasing some jam or wine directly from their respective producers. You will arrive in Passau at around 10:30 am, when this tour terminates. Here are the details on MS Normandie. We offer comfortable unisex-bikes with 7-speed gearboxes and coaster brakes or freewheel systems, equipped with a bike bag and a bike lock. We also offer E-bikes if desired. 22.04. + 20.05. + 17.06. All prices are per person in a double berth cabin on the main deck. 659 EUR travel price 22.04. + 07.10. 779 EUR travel price 06.05. + 23.09. 859 EUR travel price 20.05 + 09.09. The railway station is about 15 minutes from the quay on foot. Distance to Passau approx. 160 km, excellent train connections, journey takes approx. 2.5 hours. During your tour, we are available between 8 am and 8 pm, 7 days a week. We are happy to help with any kind of problems you might be having. You will find this emergency number in your travel documents. As is the case with all boat trips, changes in travel itineraries due to the weather, the rivers’ water levels or technical issues can be undertaken at any time. Would you like to book additional nights?/Where? Would you like to book rental bikes? Which type of rental bike? How tall are the cyclists using rental bikes? You will immediately receive acknowledgement of receipt.